Yesterday, I travelled up to a freezing Northampton with a couple of friends to see some roller derby. I first heard of the sport with the film Whip It – I was fortunate enough to attend the UK premier a couple of years ago and watched the girls play on the Southbank before the screening. 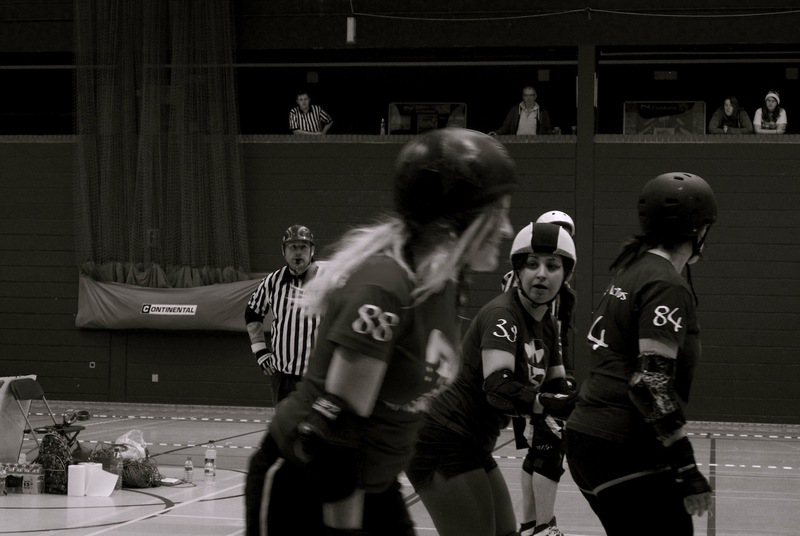 I’ve since been to a couple of London Roller Girl bouts and loved every second, but this bout was different – I knew one of the girls so this time it was personal! This was the first open door bout that my friend Triterrortops has played – a “cherry popping” bout for girls who hadn’t played in front of a crowd before. Gnomes vs Trolls, and my girl Triterrortops was on the Trolls team. It was a closely matched bout, with the Gnomes winning out in the end. But the Trolls fought hard, and I was so proud of ‘Terror – she played as the Pivot for a lot of the jams and she was so commanding! We were then treated to a second bout between the Vendetta Vixons and the Lincolnshire Bombers, and it was a very strong bout. The girls on all of the teams were very passionate and played so well. I am such awe of them. I cannot wait until my next bout, Anarchy III which is going to be on my turf, with my local team, the Surrey Roller Girls hosting a whole bunch of international teams. I’m so excited! Sad I missed out and reminded I need to buy Guildford tickets! Yes, I need to buy tickets too!